But for all those pained paddlers, all those scuttled sweepers and scullers, there is a chance to get the fix they need while awaiting the return of fairer weather. 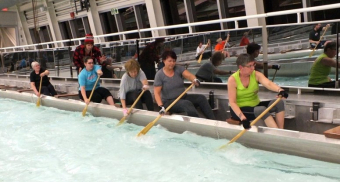 This time of year the indoor paddle tank at Welland International Flatwater Centre (WIFC) is a summer-like oasis in the bleak snow-swept landscape for athletes from several local clubs who take their training indoors. The paddle tank is a state-of-the-art facility that serves as a training ground, or rather training pool, for beginners and expert athletes alike. South Niagara Canoe Club captain KC Fraser believes training in the tank during the winter is a great way for experienced flatwater athletes to maintain their form and their fitness during the winter. 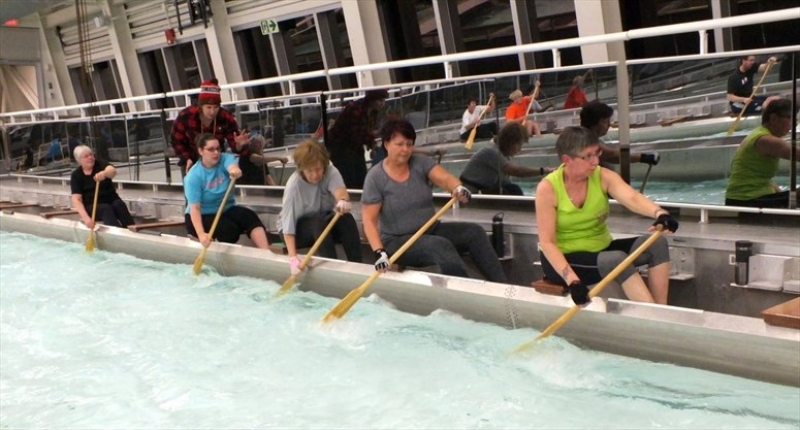 "It's also a good stepping stone for new paddlers and experienced ones as well before they get out on the water," she says during a Wednesday evening session coaching dragon boat paddlers from across Niagara. Fraser, an Olympian and two-time Pan American gold medallist in canoe-kayak sprint, is in her third year coaching at the club. She says training at the tank gives her paddlers an off-season experience as close to any they can have on the open water. Located in the athlete's centre of the WIFC's north course, the tank is legacy of the 2015 Pan Am and Parapan Am Games. What makes the tank unique is the water-recirculation feature. This allows the tank to simulate the water currents athletes experience on a real course. With other indoor tanks, the athletes need to use paddles and oars that have holes drilled through the blades. At the WIFC tank, they can use their own. And the speed of the recirculation can be increased or decreased to customize the intensity of the workout to the needs of the athletes. The tank can be set up for up to eight rowers or as many as 40 paddlers. Erin Carl, WIFC canoe polo co-ordinator, says switching between the paddling and rowing configurations takes about 45 minutes. The tank, she adds, is coming off its busiest season yet. In addition to the canoe club, South Niagara Rowing Club and Notre Dame Rowing Club rowers regularly train in the tank and the accompanying weight training and ergometer room. Carl says there is still room for more users. "We do get clubs from outside of Welland who utilize it. There aren't a lot of tanks in Niagara to use," she says. About the only thing the tank can't be used for is off-season competitions. There isn't a way for two competing teams to use the tank simultaneously, nor is there an app or sophisticated computer simulation that can pull off that trick. But until warm weather returns, and the paddlers and rowers can get back out on the open water, the paddle tank will remain the most realistic experience. When that happens in April, the tank is drained, the removable floor is replaced and the room becomes a command centre room for competitions. The tank can be booked by contacting the Flatwater Centre at 905-735-1700 ext. 4000, or at padddletank@welland.ca.